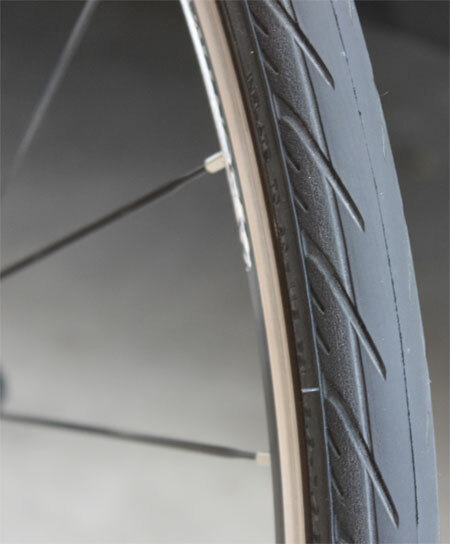 My “Bontrager T2 700X28C Road Tire Review”: Wanting better rubber for both pavement and packed limestone riding, I stumbled upon the Bontrager T2 700x28C Road Tire, and just had to order up a set to try on my Trek Cyclocross bicycle. After switching out the stock CX0 700x38C Cyclocross tires on my Trek Ion CX, I aired the Bontrager T2’s up to 110 psi, and ventured out on my daily ride. After spending just a few minutes on the Bontrager T2 tires, I knew these were going to be nice. My initial impression was that these tires are smooth and fast. Not quite as quick to accelerate as my 700×23 Bontrager R3 tires, but very smooth and fast over pavement. The ride quality was definitely more firm than the stock 700x38C CX0 tires that came on my Trek Ion CX. Athough a bit more firm than the Bontrager H2 700x28C tires that I also run on this bike. I chalk this firmness up to the higher 80-115 psi tire pressure of the T2. Much like the H2, the Bontrager T2 Tire also utilizes a 60 TPI casing with a rain shedding tread pattern that is thick yet pliable. However, without the additional plus or hardcase plus protection layer, the T2’s do not fare well against thorns. As stated with the H2 in my Bontrager H2 Tire Review, it would also be nice to see this tire offered in a 120 TPI casing. The only other complaint I have is that this tire weighs a bit more (410g), due to the wire bead. It would be great to see this tire available as an aramid bead folding tire, weighing under 300g… Hint! Hint! Bontrager. Pro’s – Very fast tire, smooth, low rolling resistance, thick tread with pattern. Con’s – 60 TPI casing, firmer ride than the H2, heavy wire bead. The Bontrager T2 Tire is good for recreational riding, training, and touring over mixed paved roads and packed limestone trails. As long as you do not anticipate encounters with THORNS! Although with its better thorn resistance, and a plush ride, I feel that the H2 tire (in hardcase form) may be one of the Best Bicycle Tire for Pavement and Crushed Limestone.